The challenge: try not to travel for a particular period of time – it could be one month or one year – to rediscover your wanderlust. 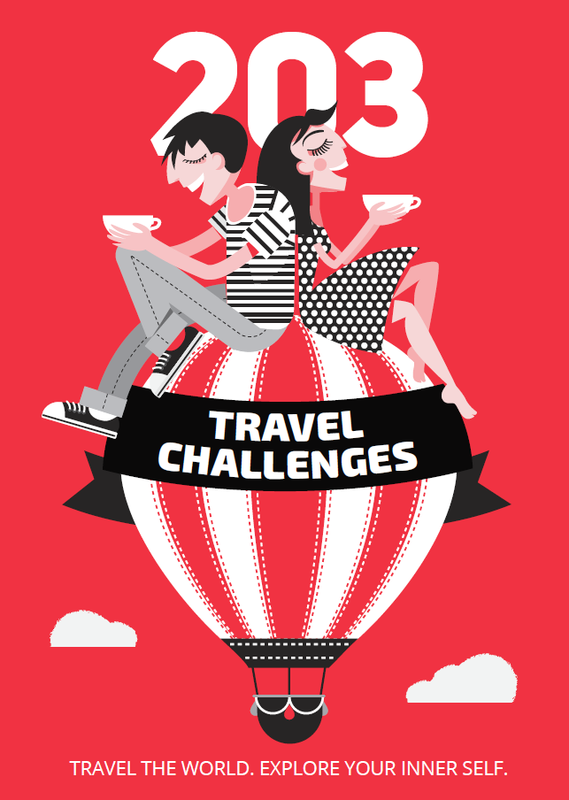 This is a challenge for the most addicted globetrotters out there. I can rarely resist the urge to book my next flight, so I know how hard it can be to settle down. But there are certain moments in life when you need to stay in one place and focus on yourself. The time you’ll take off from traveling will let you concentrate on where you want to be in your life. Strive for greatness, build a career or take your relationship to the next level. You might be finally ready to buy a car or invest in a house, but you won’t be able to pull that off if you spend a week abroad every month. Even though I’m passionate about traveling, I’ve realized that it’s not the secret ingredient to happiness, despite what your friends’ pictures on social media may have you believe. You might be surprised to hear that from a travel writer, so let me explain. You’ve been traveling for months, you’ve seen many wonders of the world and you’ve visited your top 10 dream destinations. You’ve been to festivals, concerts, events; you’ve met incredible people along the way. Then one day you end up staying in. You feel emotionally empty. You don’t want to do a single thing, and yet spending the day at home feels like such a waste of time. What if you miss a once-in-a-lifetime opportunity?! The truth is traveling won’t necessarily make you happier. It is a strong drug with lots of side effects. Long-term travelers often find themselves tired, angry or sad, just like everyone else. So, what do you do if you end up in their shoes? Like everything in life, travel calls for balance. The secret lies in deprivation and appreciation. Don’t rush out to your next destination; take a moment to contemplate your life. We are lucky to live in an age when travel is affordable and quite accessible. We’ve become used to it and even begun to take it for granted. Make your favorite activity a treat! How? Back in time, the Stoics (members of the philosophical school of Stoicism) understood just how miserable runaway desire can make you feel. For example, Epictetus once wrote that “a wise man is the one who does not grieve for the things which he has not, but rejoices for those which he has”. What’s something you used to cherish that you now take for granted? Well, you have the absolute and unconditional right to move freely around the globe, but you might have stopped taking pleasure in it. The verdict is you have reached the deprivation point. What should you do? Cut back on travel for a while. You could stop traveling for three months or three years – it all depends on you. This is not a “give it up for good” call; it’s an invitation to “leave it for later”. If you abstain from travel for a short period of time, when you come back to it, you’ll love it even more. This philosophy is not about restricting your enjoyment of life, but about enhancing it. The Stoics believed that living in the present moment allows us to get more out of our lives. Here’s what inspired me: an article by Eric Barker on how Stoic ideas can make you happy. Eric is one of my favorite bloggers; he uses science-based answers and expert insights to creates guides on being awesome at life. Be present, wherever you are. Once you’ve embarked on your journey, slow down your pace. Pick one or two destinations instead of a list of must-sees. Take time to indulge in your meals, talk to people, wander aimlessly or just marvel at the beautiful sights around you. Did you know there’s a disease called dromomania? You might have heard of it by its other name: wanderlust. It is defined as an uncontrollable urge to wander, spontaneously depart, leave your routine and travel long distances. So, if you accept our challenge to deprive yourself of travel for a while but still can’t control your urges, you might be a dromomaniac. Your suitcase is never fully unpacked; you use it as a makeshift wardrobe. You carry at least three different currencies in your wallet… just in case. The thought of staying home for the weekend makes you panic. Read the full list of dromomania symptoms here.